It is our favorite Fall/Winter soup. It even looks like fall when leaves on the trees change colors to yellow, orange, and red while some surprisingly stay green. When it rains or the wind is blowing so strong making us hurry up in the warm shelter of our homes, this soup is the best “comfort food” – sweet, warming, and satiating. Easy to make, easy to digest, and healthy. 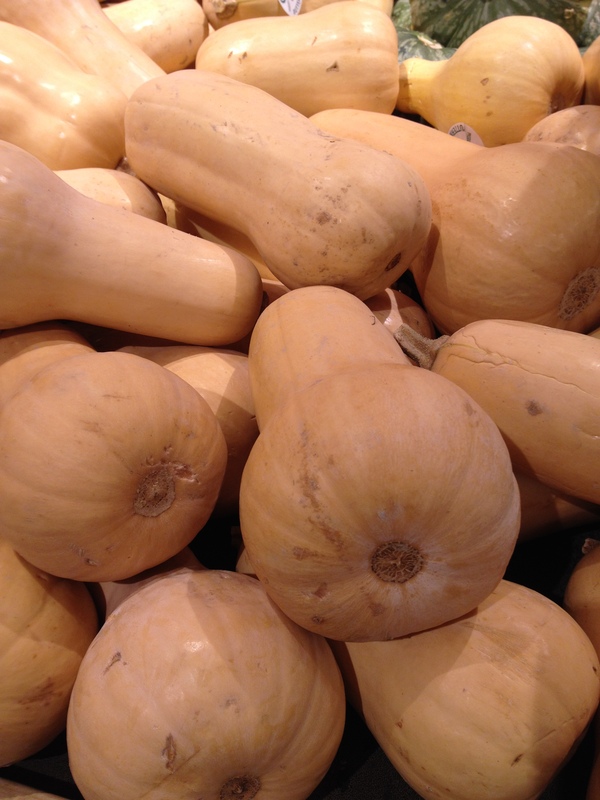 Butternut squash belongs to the family called “winter squash” – seasonal vegetables with tons of vitamins. It is designed to keep you warm regardless of cold weather. It can stay in the fridge for 2 – 3 days… Yum! Cut onion into 1/2 inch pieces. Put a cooking pot on the range, add olive oil. After a few moments when oil is warm add onion. Reduce the flame and let the onion simmer. It may become slightly light brown. Slowly pour cold water on top of vegetables until they are almost covered. Increase the flame so water can reach boiling point. Reduce the flame when it boils, add salt, cover with a lid but leave some room so nothing would escape from the pot. Cut fresh ginger into very small pieces and add to the pot. Cut parsley and add to the pot. Cook for another minute. Turn off the flame. Let it cool off a little to protect your mixer knives from becoming dull. Try it for salt. Add salt if needed to your taste. Butternut squash has very low calories. It contains no saturated fats or cholesterol; however, is a rich source of dietary fiber. Squash is one of the common vegetables that often recommended by dieticians in the cholesterol controlling and weight-reduction programs. It has more vitamin A than other vegetables, constituting about 354% of RDA. Vitamin A is a powerful natural anti-oxidant and is required by the body for maintaining the integrity of skin and mucus. It is also an essential vitamin for optimum eye-sight. Research studies suggest that natural foods rich in vitamin A help the body protected against lung and oral cavity cancers. It is rich in the B-complex group of vitamins like folate, riboflavin, niacin, vitamin B-6, thiamin, and pantothenic acid. It contains adequate levels of minerals like iron, zinc, copper, calcium, potassium, and phosphorus. 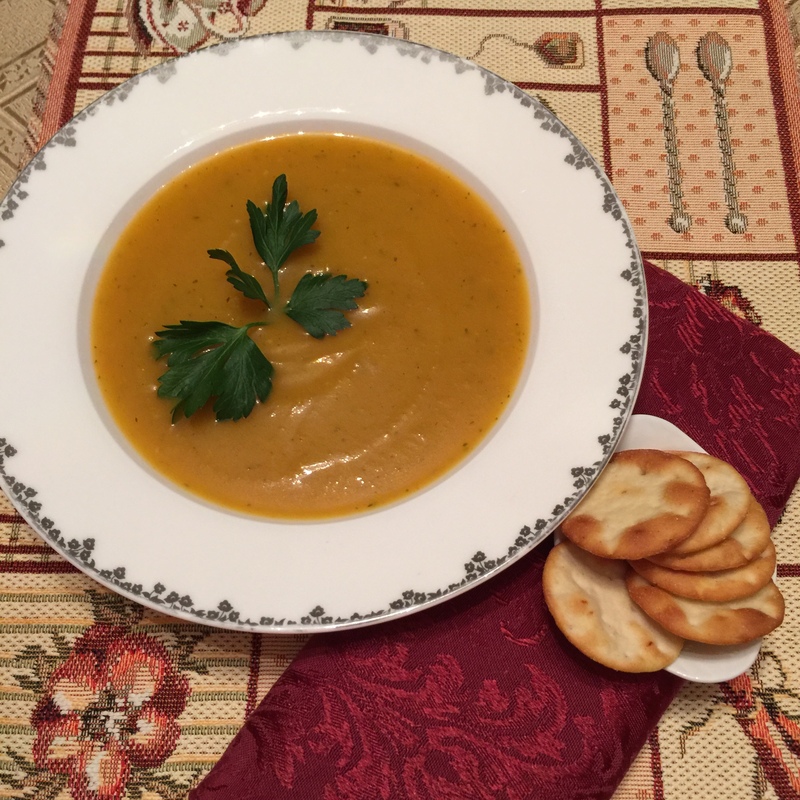 This entry was posted in healthy kosher recipes, healthy simple recipes, Kosher Food, macrobiotic, plant based diet, vegan, vegetarian and tagged Butternut squash, dinner, fit food, gluten free, glutenfree, healingdiet, healthy cooking, healthyrecipes, homemade, soup, Vegetable Soup, Vegetarian, winter squash by Chava. Bookmark the permalink. This sounds so good I think I will buy a butternut squash! I love this soup.. Thanks much for introducing me to this soup. This is my favorite soup. A comfort food I go to on a cold, rainy day.